In 1966, nine young men left the Arizona desert mining camp of Morenci to serve their country in the far-flung jungles of Vietnam, in danger zones from Hue to Khe Sanh. Ultimately, only three survived. Each battled survivor’s guilt, difficult re-entries into civilian life, and traumas from personally experiencing war—and losing close friends along the way. 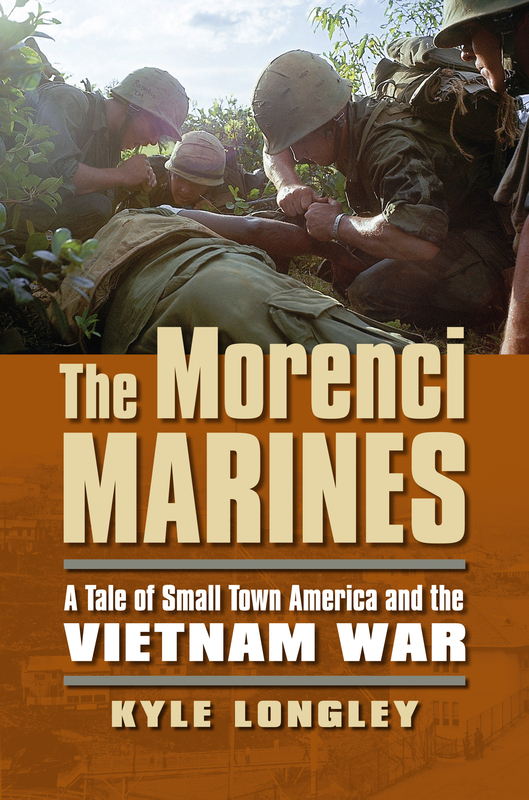 Such stories recurred throughout America, but the Morenci Marines stood out. ABC News and Time magazine recounted their moving tale during the war, and, in 2007, the Arizona Republic selected the “Morenci Nine” as the most important veterans’ story in state history. Returning to the soldiers’ Morenci roots, Kyle Longley’s account presents their story as unique by setting and circumstance, yet typical of the sacrifices borne by small towns all across America. His narrative spotlights a generation of young people who joined the military during the tumultuous 1960s and informs a later generation of the hard choices made, many with long-term consequences. The story of the Morenci Marines also reflects that of their hometown: a company town dominated by the Phelps Dodge Mining Corporation, where the company controlled lives and the labor strife was legendary. The town’s patriotic citizens saw Vietnam as a just cause, moving Clive Garcia’s mother to say, “He died for this cause of freedom.” Yet while their sons fought and sent home their paychecks, Phelps Dodge sought to destroy the union that kept families afloat, pushing the government to end a strike that it said undermined the war effort. Morenci was also a place where cultures intermingled, and the nine friends included three Mexican Americans and one Native American. Longley reveals how their backgrounds affected their decisions to join and also helped the survivors cope, with Mike Cranford racing his Harley on back roads at high speeds while Joe Sorrelman tried to deal with demons of war through Navajo rituals. Drawing on personal interviews and correspondence that sheds new light on the Morenci Nine, Longley has written a book as much about loss, grief, and guilt as about the battlefield. It makes compelling reading for anyone who lived in that era—and for anyone still seeing family members go off to fight in controversial wars. Kyle Longley is the Snell Family Dean’s Distinguished Professor of History and Political Science at Arizona State University and author of Grunts: The American Combat Soldier in Vietnam and In the Eagle’s Shadow: The United States and Latin America.